Eating pizza in a street café in the south of Italy, doesn't that sound like heaven? Unfortunately most of us wont be heading to Italy any time soon but, provided you have a little bit of imagination, I've got a great alternative if you are planning on staying in Newcastle this Summer. 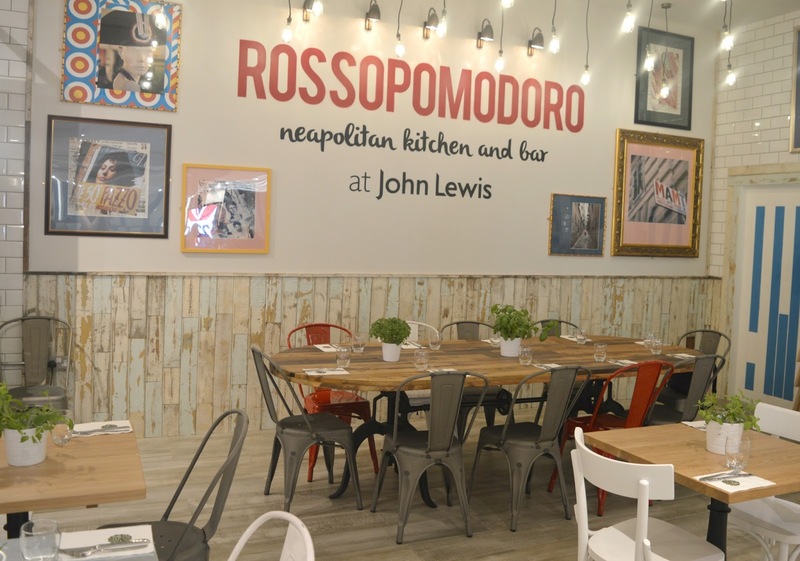 Rossopomodoro, hidden inside John Lewis in Eldon Square, offers an extensive and authentic menu of delicious Neapolitan food, and I guarantee if you shut your eyes whilst eating you will be instantly transported to Italy. 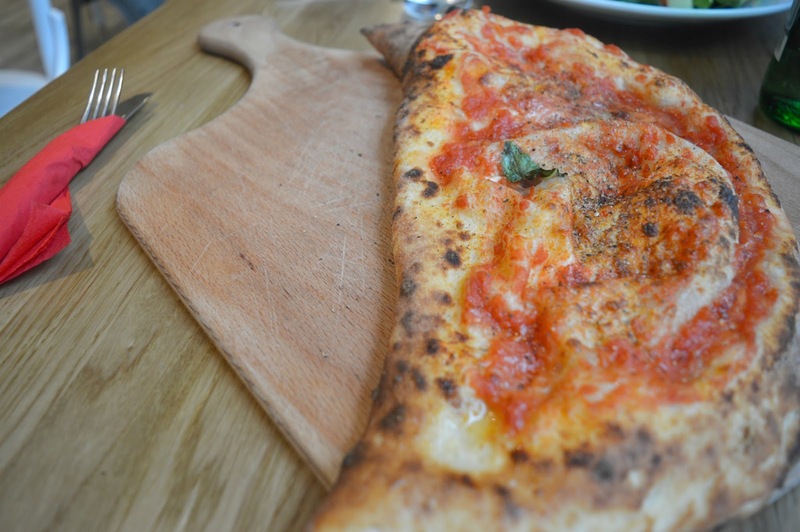 You may remember that I visited Rossopomodoro back when it first opened in Eldon Square and was really impressed so I was keen to revisit when I heard that they had launched a new menu. Full of delicious new flavours featuring Neapolitan tomatoes, Mortadella, roasted Porchetta and seafood as well as plenty of new dishes including Pagnottielli, stuffed pizza dough bun and plenty of seasonal pasta and salads, it all sounded amazing. The menu at Rossopomodoro is overwhelmingly huge and, for a foodie like me, it's not easy to make a decision when you're presented with so much choice. 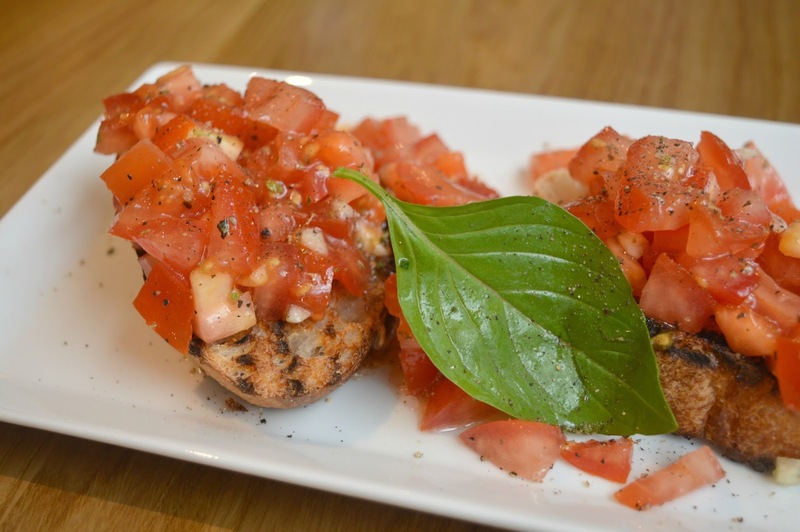 I decided to start with Bruschetta and picked the Pomodorina (£4.95) - chargrilled homemade bread, fresh vine tomatoes seasoned with garlic and basil. I was feeling pretty virtuous when my dish appeared, there were so many tomatoes on my plate I was confident that I was going to easily hit my "five a day" in one bite. It tasted really fresh and so full of flavour, the perfect start to my meal. Despite being pretty full already from my starter I was instantly drawn to the I Calzoni menu, when it comes to calzoni my eyes are forever bigger than my belly. I always forget how huge and filling they are. I went for the Ripieno (£12.95) an indulgent calzoni stuffed with mozzarella, ham, buffalo ricotta, mushrooms, tomato sauce and basil. Definitely not one for the dainty diner, when it showed up even I was amazed at how huge it was. It was delicious and easily one of the best calzoni I've ever had. Despite its size I managed to eat the entire thing with not even a speck of sauce left on my plate. I clearly have expensive taste in dessert as I ordered the Tortino Al Cioccolato (£7.95) - quite a hefty price for dessert but the description made it sound like it could be worth it. 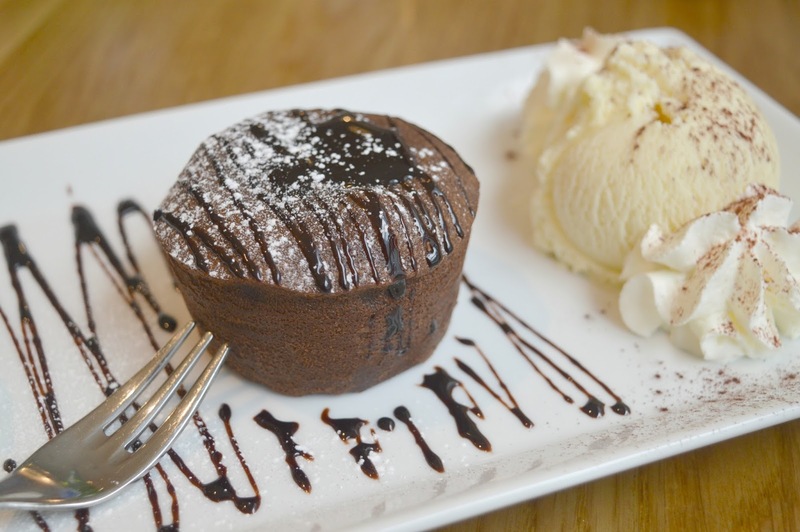 Hot dark chocolate soufflé served with ice cream. Definitely one for the chocolate lover, I could have sat and watched that delicious chocolate pouring out of the centre of my dessert all night. 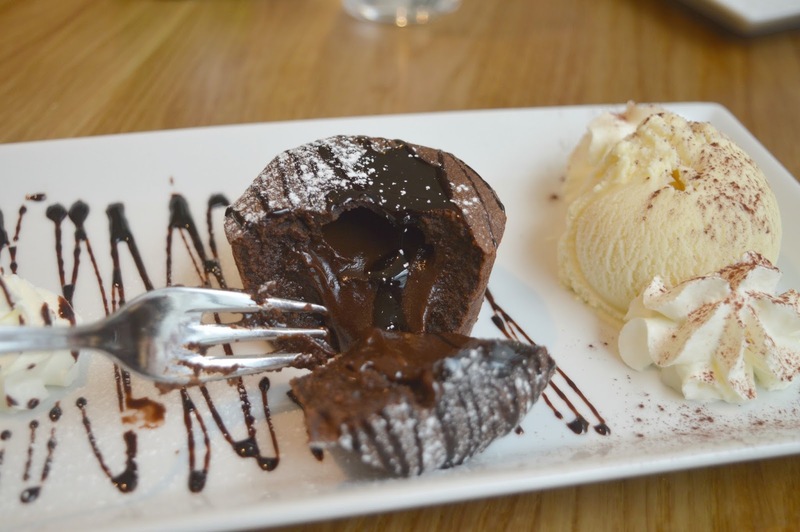 It's definitely worth your extra pennies if you live for chocolate desserts. Up until this point I'd more or less been ignoring my friend's meal, I'd been far too interested in my own. Lucky for you she ordered something that I know you'll all be interested in. 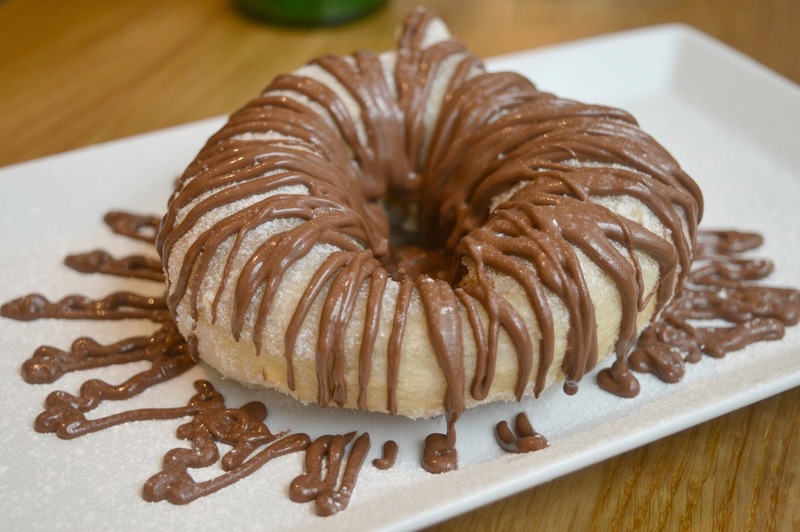 The Calda Calda (£5.95) consists of sweet fried pizza dough, vanilla sugar and nutella. Unfortunately my nut allergy makes this an obvious one to avoid which I'm so sad about as she seemed to be loving every second of it. It smelt amazing! I've definitely left you with a photo that'll get your tummies growling. I'm pretty sure the only cure is to book a table at Rossopomodoro so you can try out all that delicious food for yourself. Let me know if you try anything different on the menu. Thank you to Rossopomodoro for inviting me for dinner. My meal was complimentary, but all opinions are my own. Chloe.. I was wide-eyed reading this and the pictures.. But that last dessert pic has made my mouth water!!! Mmm everything sounds amazing - especially those desserts!